Fab-Seal Industrial Liners, Inc. is the industry leader in manufacturing and installing membrane lining systems, offering premium quality industrial lagoon liners for sale. For over three decades, the professionals at Fab-Seal have built a solid industry reputation for supplying and servicing lagoon liners for a wide range of industrial applications. Call 800-874-0166 now and trust the industry experts at Fab-Seal Industrial Liners, Inc. to have lagoon liners for sale that will perfectly suit your industrial needs. Lagoon liners for sale are manufactured by industry experts and are professionally designed to meet your project or job specifications. Fab-Seal’s lagoon liners are then installed by trained, experienced, and reliable technicians. The industrial-grade lagoon liners produced by the industry experts at Fab-Seal are made from premium quality materials. We offer professional design, fabrication and installation of industrial lagoon liners, which can generally be installed in less than a week. 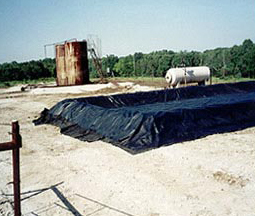 Lagoon liners for sale at Fab-Seal Industrial Liners, Inc. are made to contain the fluid that needs to be controlled, and the secondary containment lagoon liners act as the last line of defense behind the primary liner. Fab-Seal Industrial Liners, Inc. strives to make your industrial lagoon liners extremely compatible to nearly all inorganic and corrosive liquids. Most of the large metal tank and concrete tank system for lagoon liners can be professionally installed in seven days or less. Fab-Seal's liner systems are fabricated in our factory using dielectric sealing of the same material.